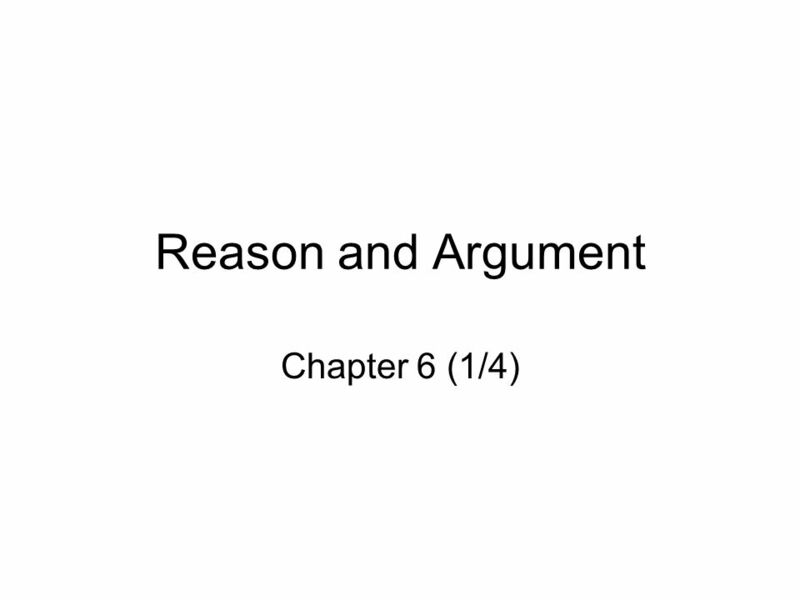 Reason and Argument Chapter 6 (1/4). 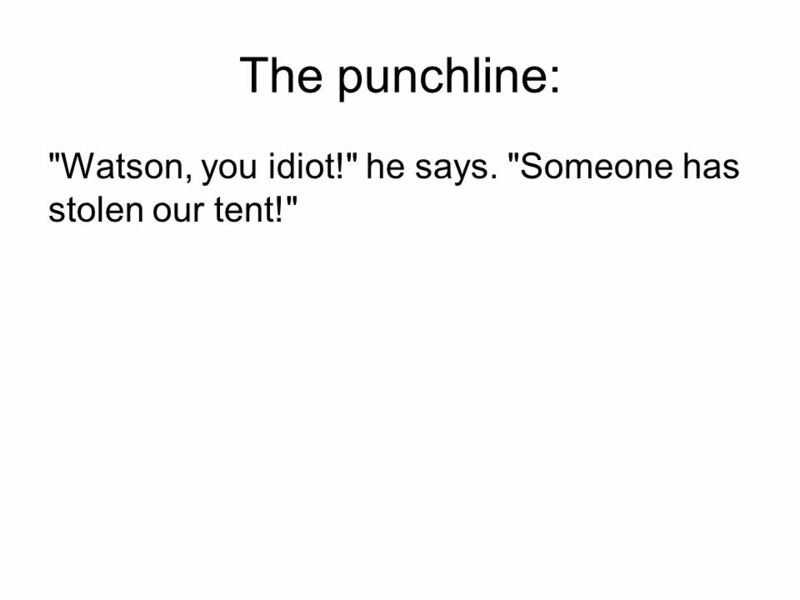 3 A joke: Sherlock Holmes and Dr. Watson go on a camping trip. After a good dinner and a bottle of wine, they retire for the night, and go to sleep. Some hours later, Holmes wakes up and nudges his faithful friend. "Watson, look up at the sky and tell me what you see." "I see millions and millions of stars, Holmes" replies Watson. "And what do you deduce from that?" Watson ponders for a minute. "Well, astronomically, it tells me that there are millions of galaxies and potentially billions of planets. Astrologically, I observe that Saturn is in Leo. Horologically, I deduce that the time is approximately a quarter past three. Meteorologically, I suspect that we will have a beautiful day tomorrow. Theologically, I can see that God is all powerful, and that we are a small and insignificant part of the universe. 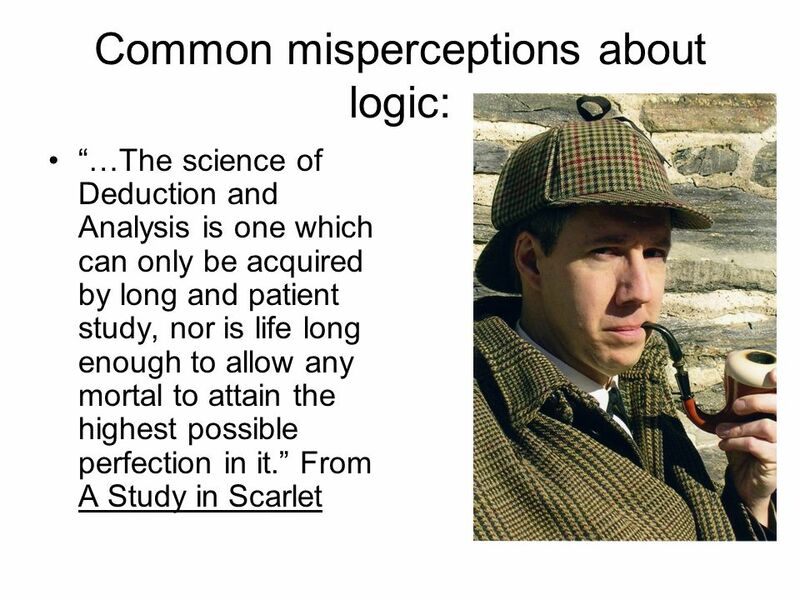 What does it tell you, Holmes?" 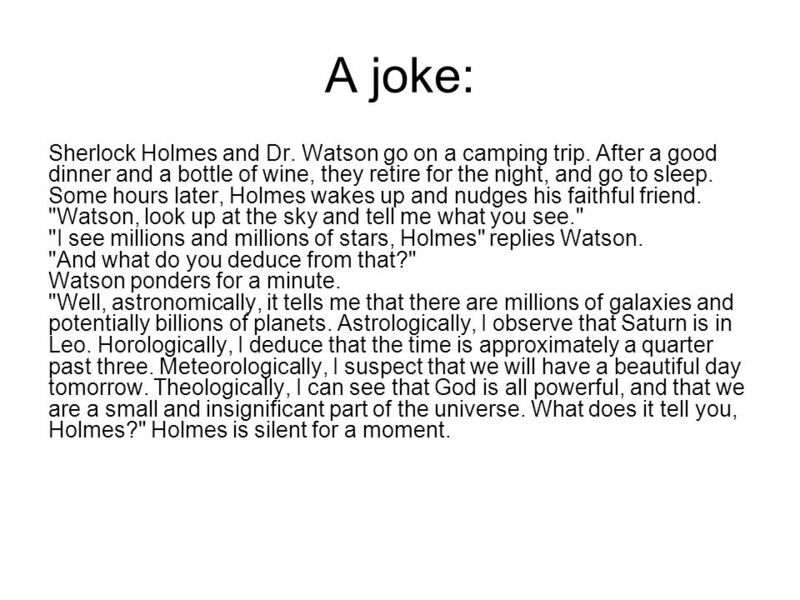 Holmes is silent for a moment. 4 The punchline: "Watson, you idiot!" he says. "Someone has stolen our tent!" 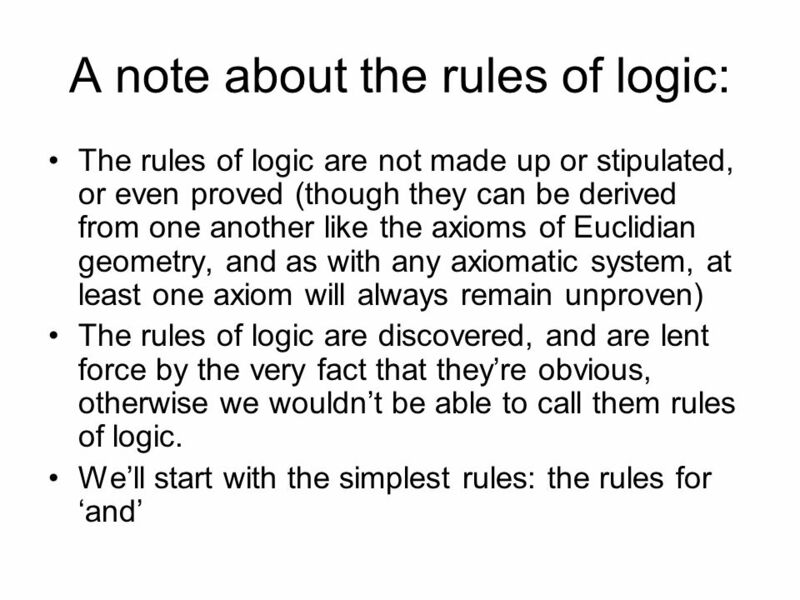 Typically, Spock said nothing about logic, per se. 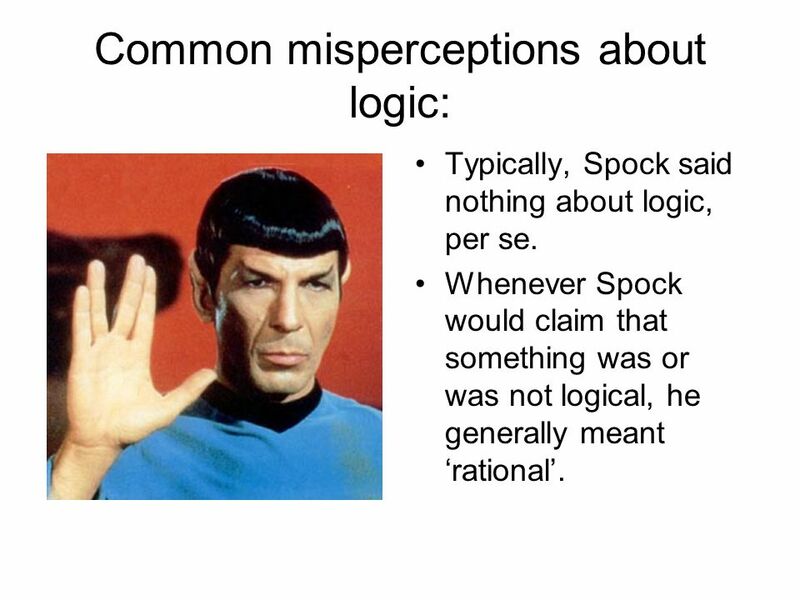 Whenever Spock would claim that something was or was not logical, he generally meant ‘rational’. 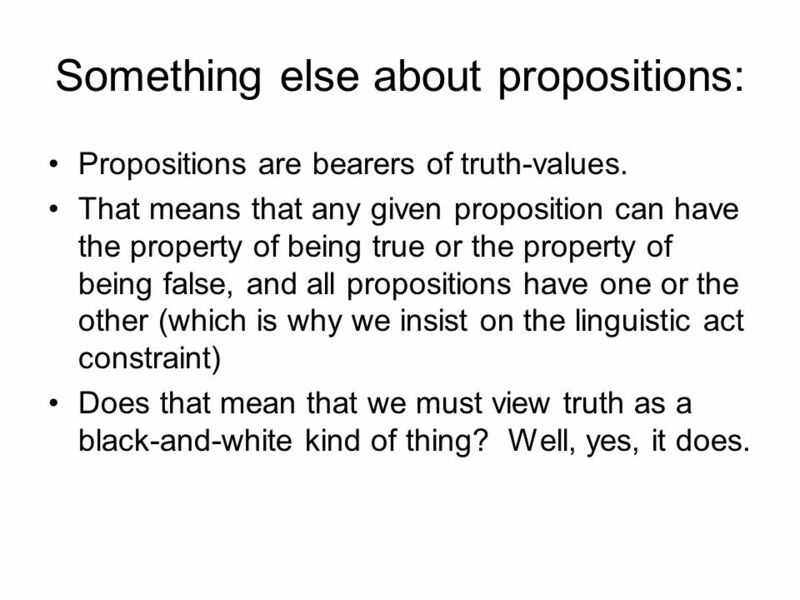 The textbook authors are (understandably) imprecise about talk of propositions. 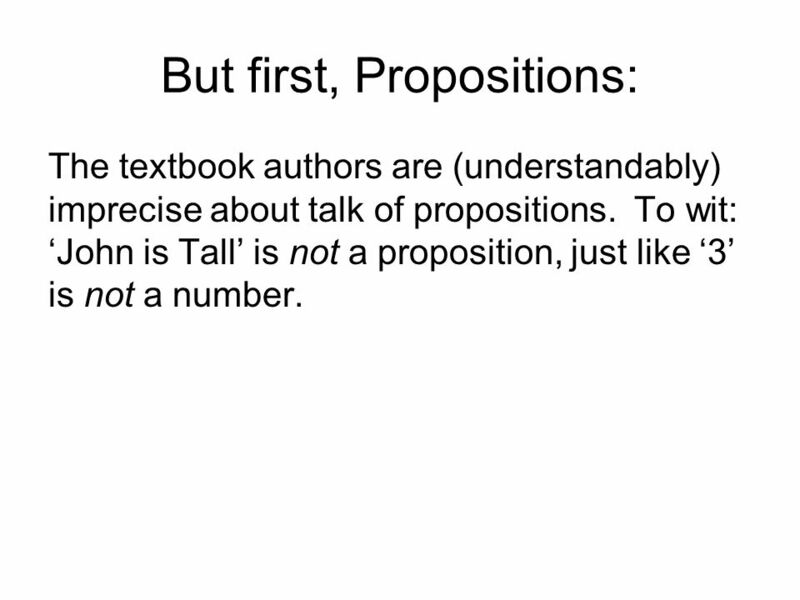 To wit: ‘John is Tall’ is not a proposition, just like ‘3’ is not a number. 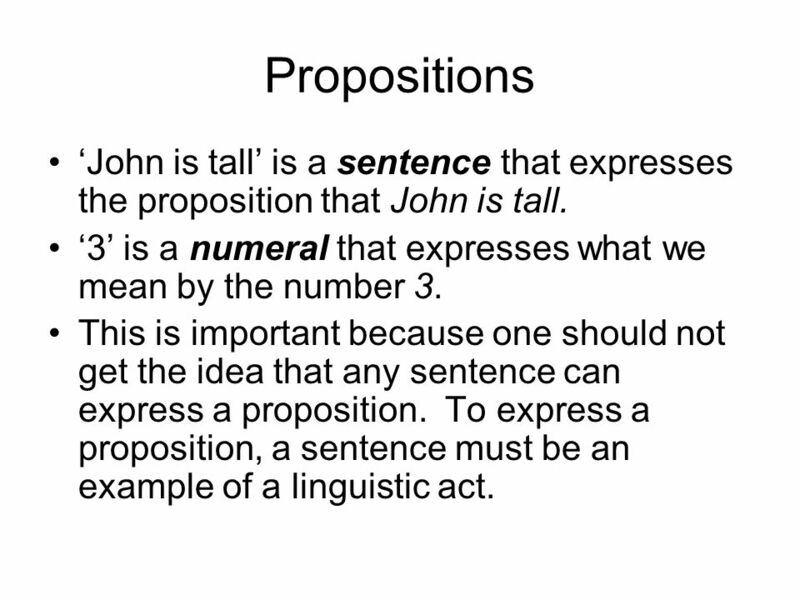 8 Propositions ‘John is tall’ is a sentence that expresses the proposition that John is tall. ‘3’ is a numeral that expresses what we mean by the number 3. This is important because one should not get the idea that any sentence can express a proposition. To express a proposition, a sentence must be an example of a linguistic act. p & q represents any two joined propositions. Though the rule in the book (p. 144) allows that different variables be replaced by the same proposition, for practical purposes we will never do this. 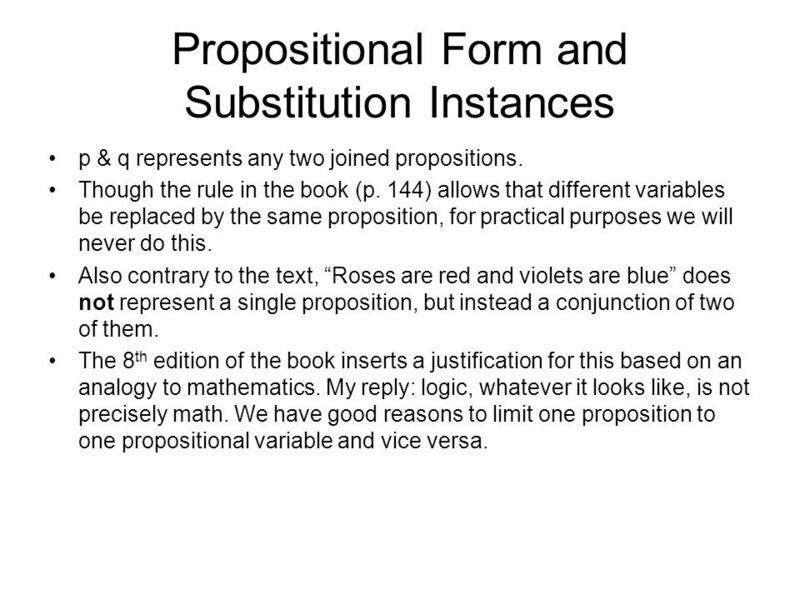 Also contrary to the text, “Roses are red and violets are blue” does not represent a single proposition, but instead a conjunction of two of them. The 8th edition of the book inserts a justification for this based on an analogy to mathematics. My reply: logic, whatever it looks like, is not precisely math. 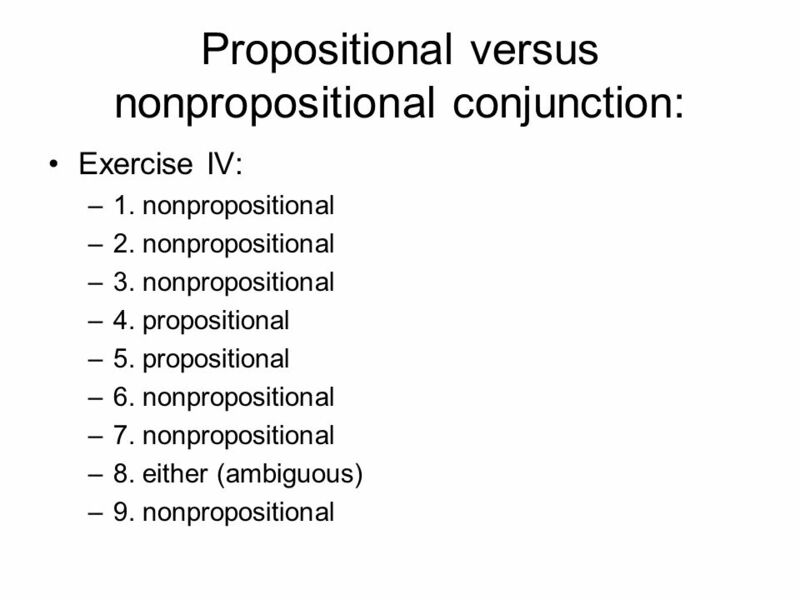 We have good reasons to limit one proposition to one propositional variable and vice versa. Propositions are bearers of truth-values. 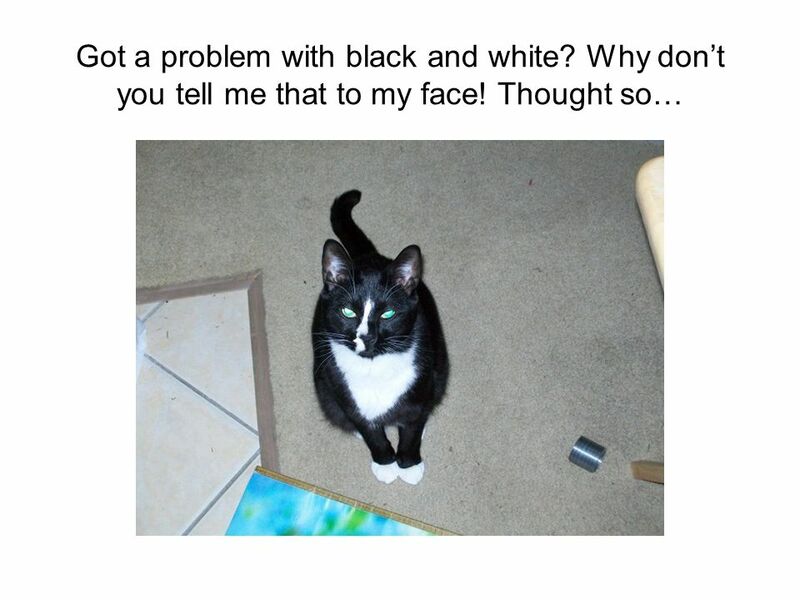 That means that any given proposition can have the property of being true or the property of being false, and all propositions have one or the other (which is why we insist on the linguistic act constraint) Does that mean that we must view truth as a black-and-white kind of thing? Well, yes, it does. Since propositions are expressed by sentences that are meaningful, they reflect states of affairs. In other words, they reflect the way things are or are not. Take the proposition expressed by the sentence ‘John is tall’. 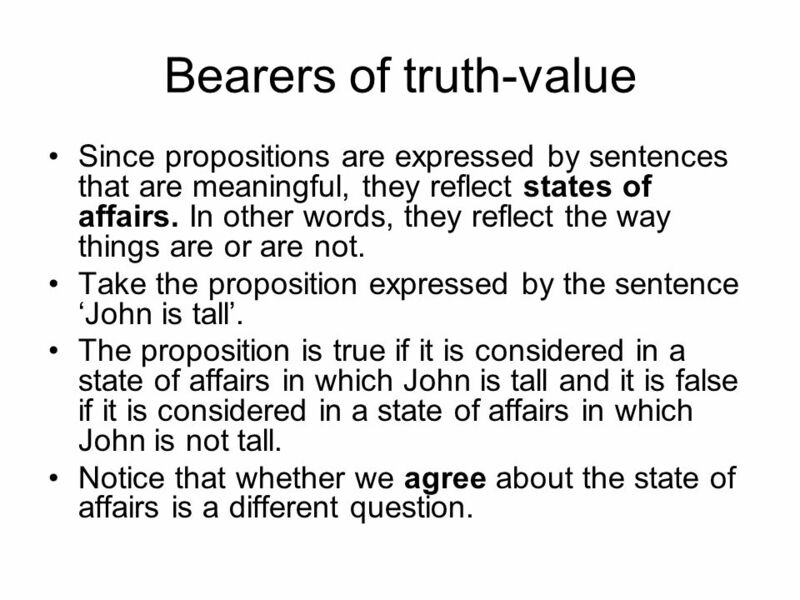 The proposition is true if it is considered in a state of affairs in which John is tall and it is false if it is considered in a state of affairs in which John is not tall. Notice that whether we agree about the state of affairs is a different question. 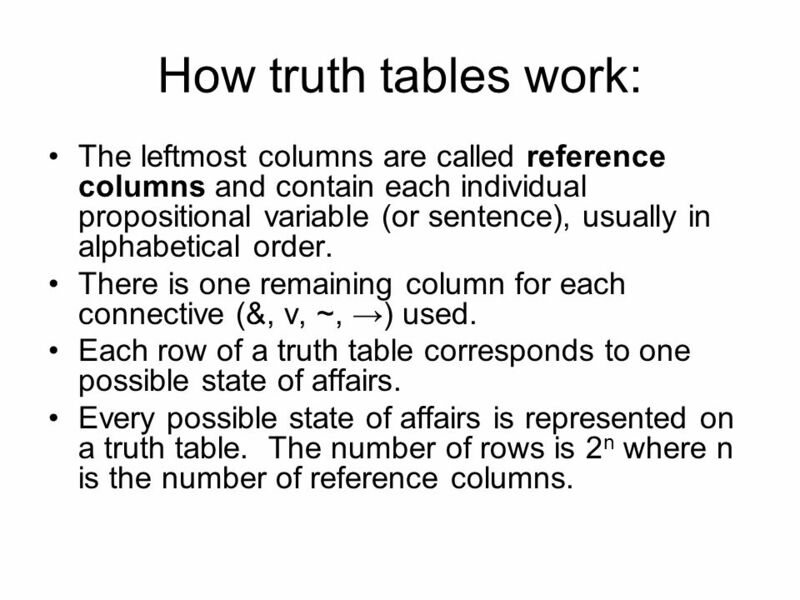 13 How truth tables work: The leftmost columns are called reference columns and contain each individual propositional variable (or sentence), usually in alphabetical order. 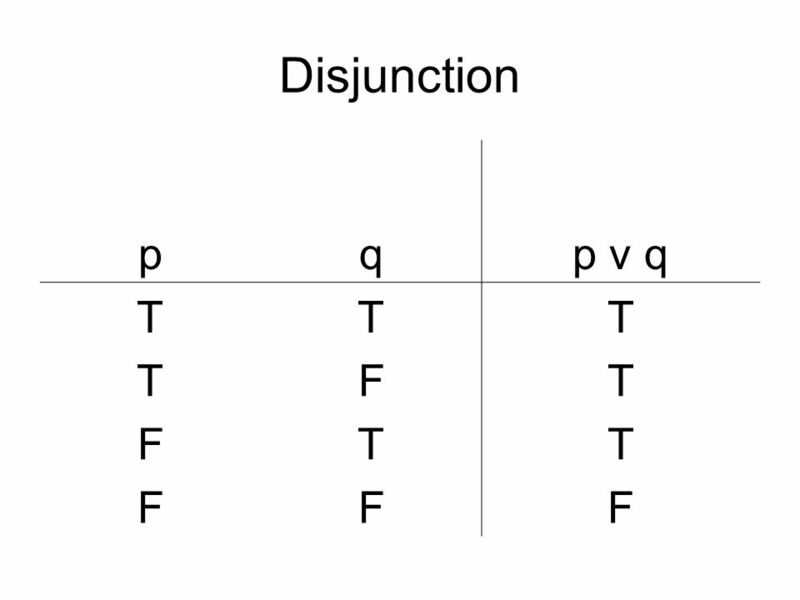 There is one remaining column for each connective (&, v, ~, →) used. 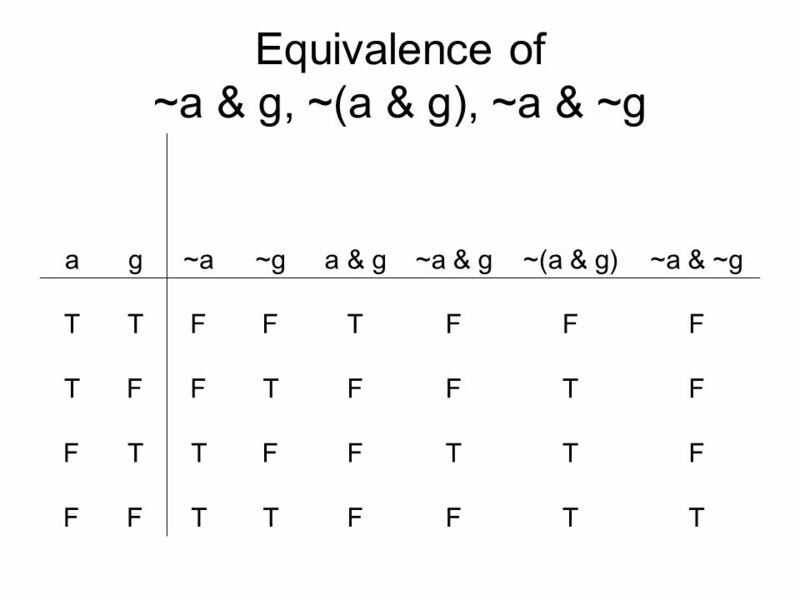 Each row of a truth table corresponds to one possible state of affairs. 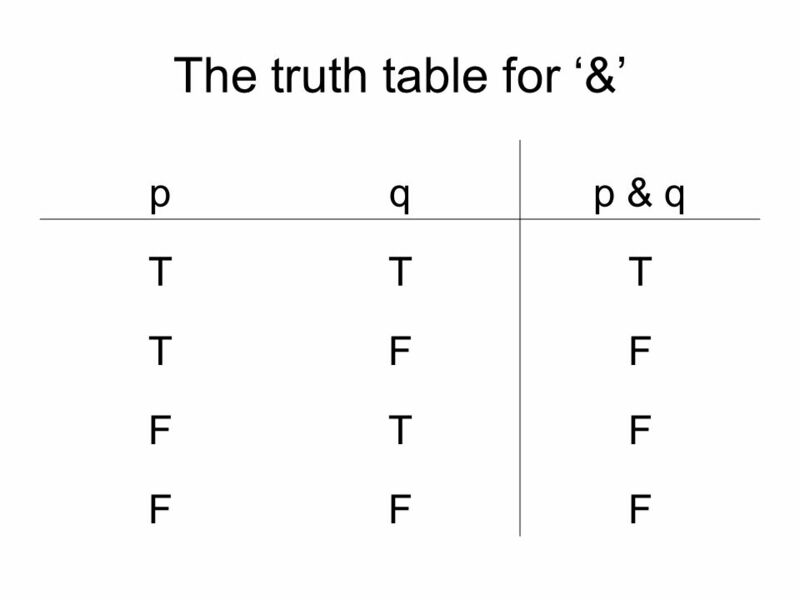 Every possible state of affairs is represented on a truth table. The number of rows is 2n where n is the number of reference columns. 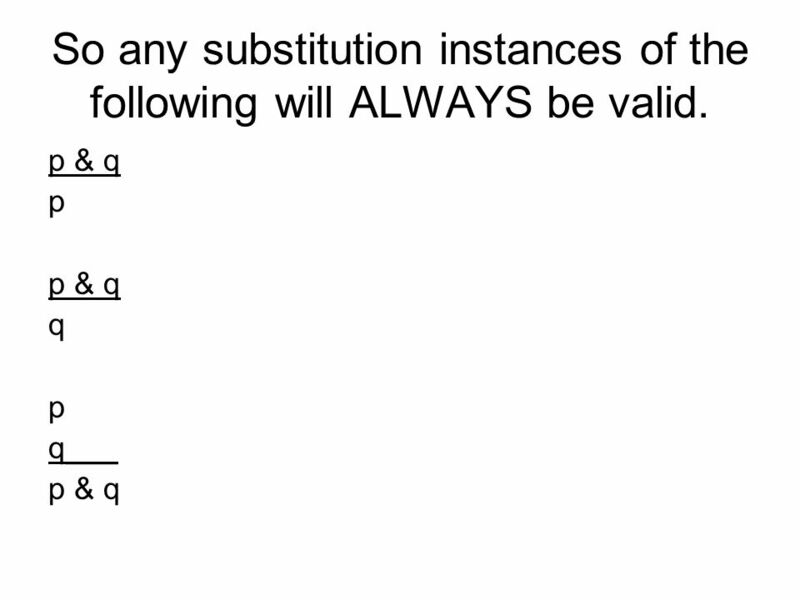 21 So any substitution instances of the following will ALWAYS be valid. 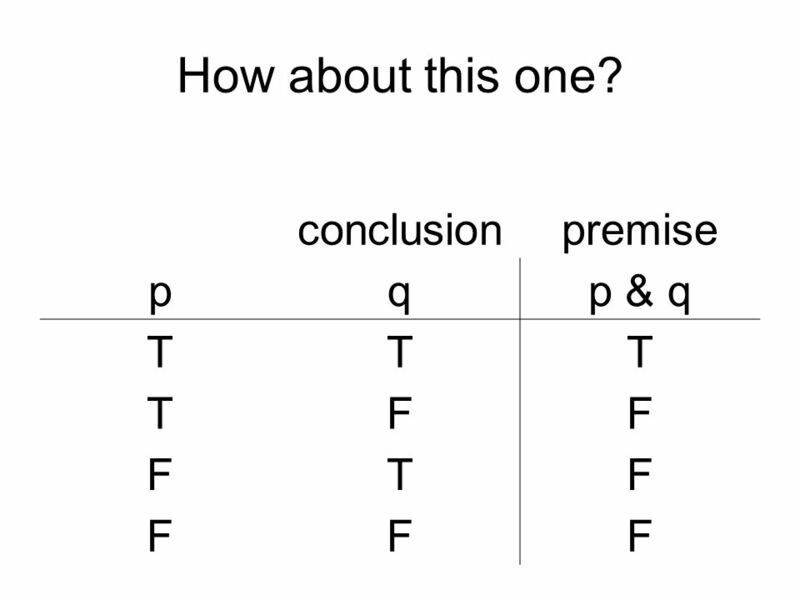 Sometimes when a person says something of the form “p or q” they mean “p or q or both” and sometimes they mean “p or q and not both”. 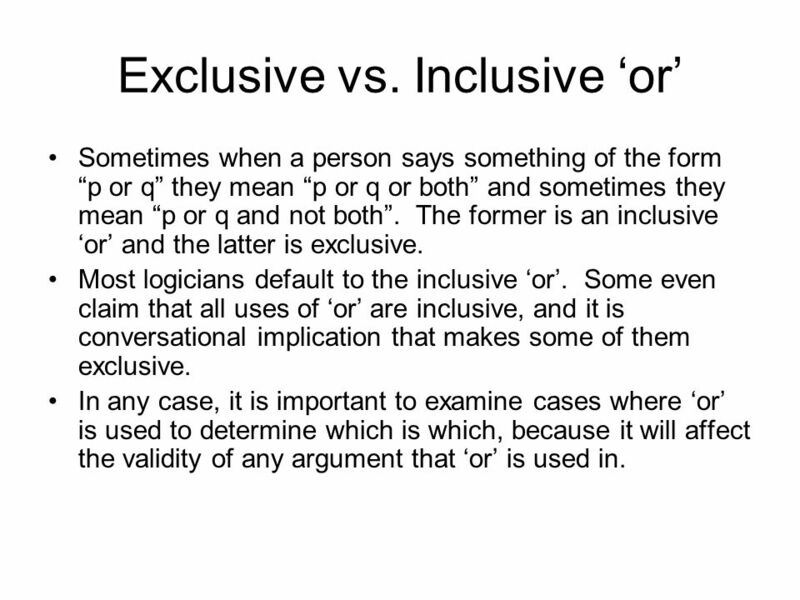 The former is an inclusive ‘or’ and the latter is exclusive. 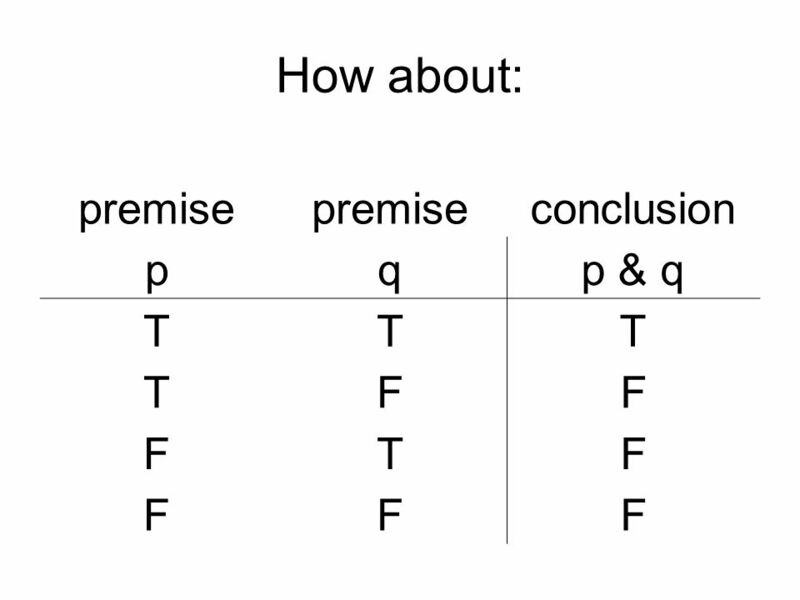 Most logicians default to the inclusive ‘or’. 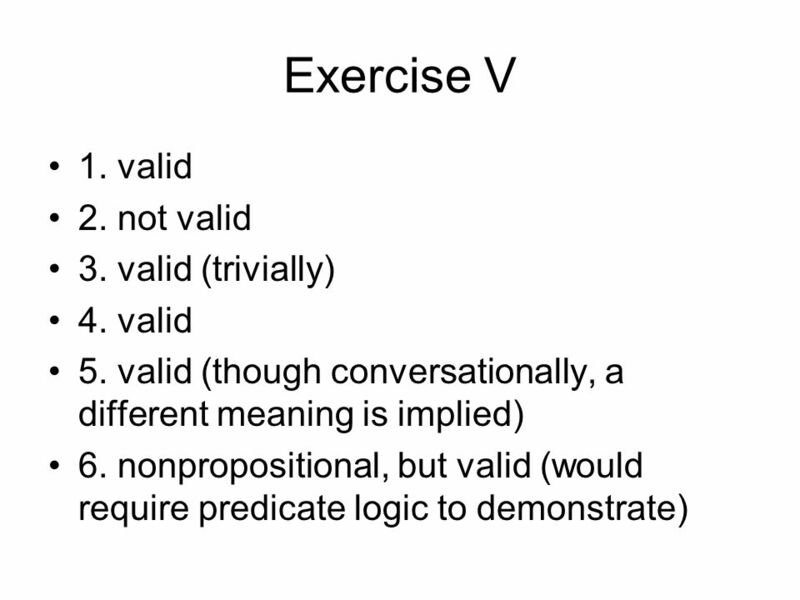 Some even claim that all uses of ‘or’ are inclusive, and it is conversational implication that makes some of them exclusive. 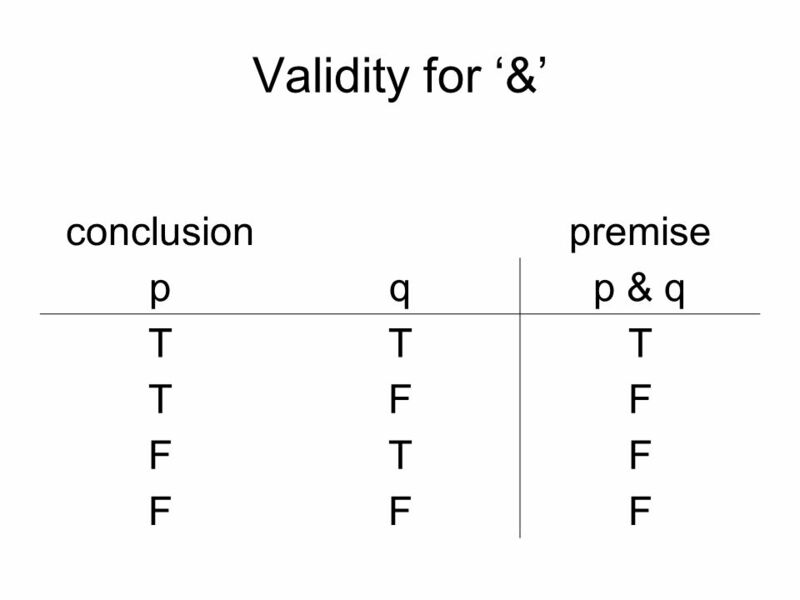 In any case, it is important to examine cases where ‘or’ is used to determine which is which, because it will affect the validity of any argument that ‘or’ is used in. 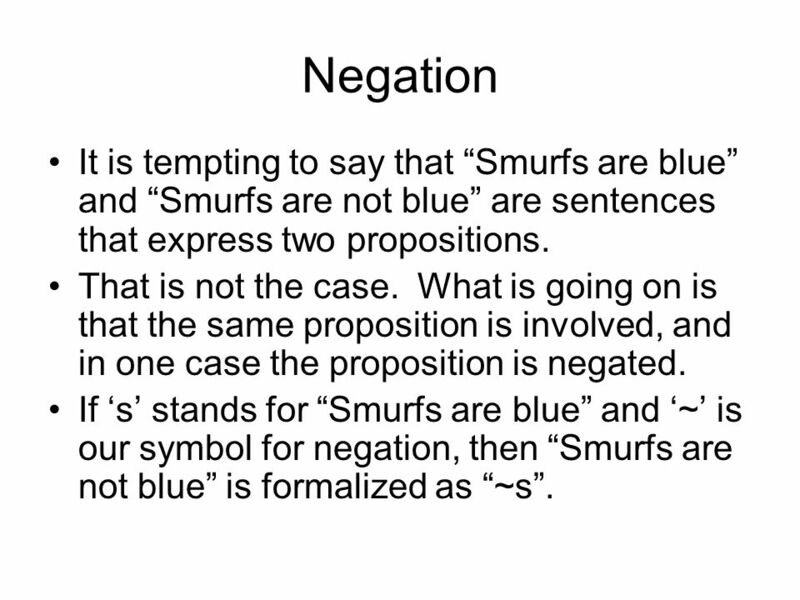 26 Negation It is tempting to say that “Smurfs are blue” and “Smurfs are not blue” are sentences that express two propositions. That is not the case. 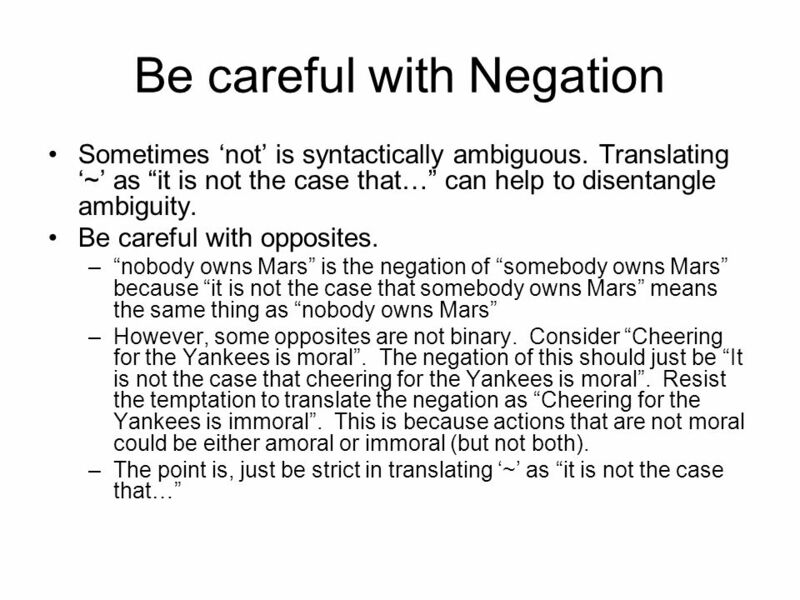 What is going on is that the same proposition is involved, and in one case the proposition is negated. If ‘s’ stands for “Smurfs are blue” and ‘~’ is our symbol for negation, then “Smurfs are not blue” is formalized as “~s”. Notice that ~a & g means something different than ~(a & g). 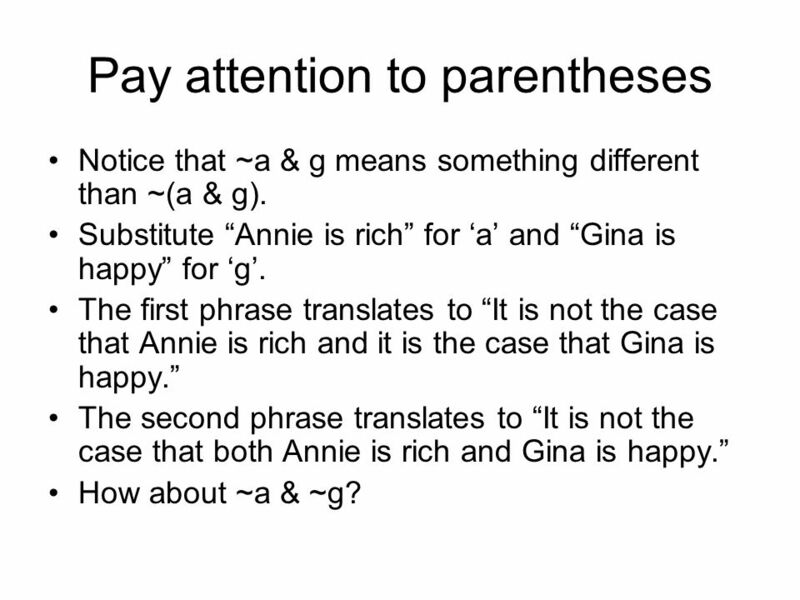 Substitute “Annie is rich” for ‘a’ and “Gina is happy” for ‘g’. The first phrase translates to “It is not the case that Annie is rich and it is the case that Gina is happy.” The second phrase translates to “It is not the case that both Annie is rich and Gina is happy.” How about ~a & ~g? 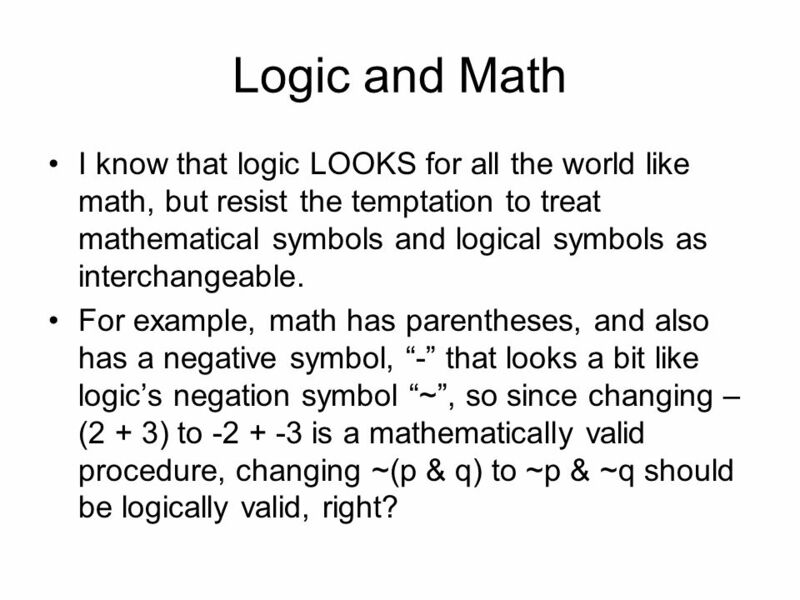 34 Logic and Math I know that logic LOOKS for all the world like math, but resist the temptation to treat mathematical symbols and logical symbols as interchangeable. 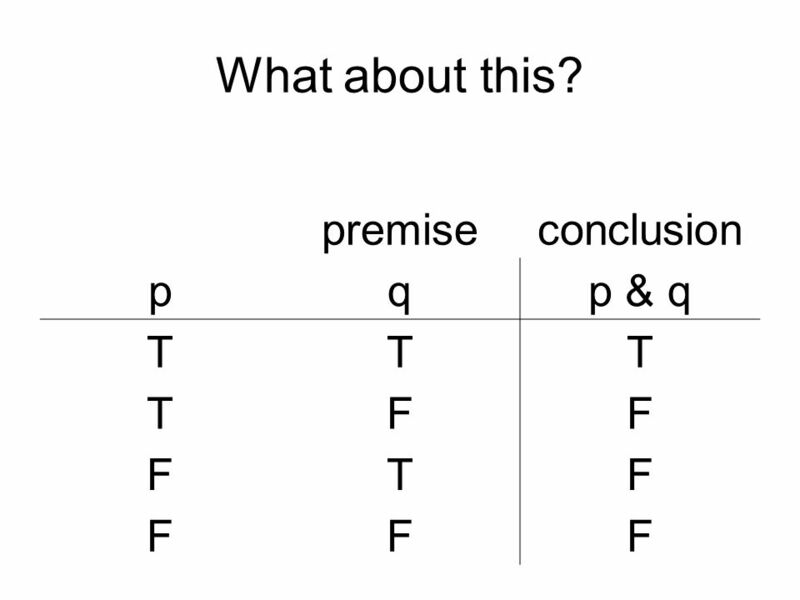 For example, math has parentheses, and also has a negative symbol, “-” that looks a bit like logic’s negation symbol “~”, so since changing –(2 + 3) to is a mathematically valid procedure, changing ~(p & q) to ~p & ~q should be logically valid, right? 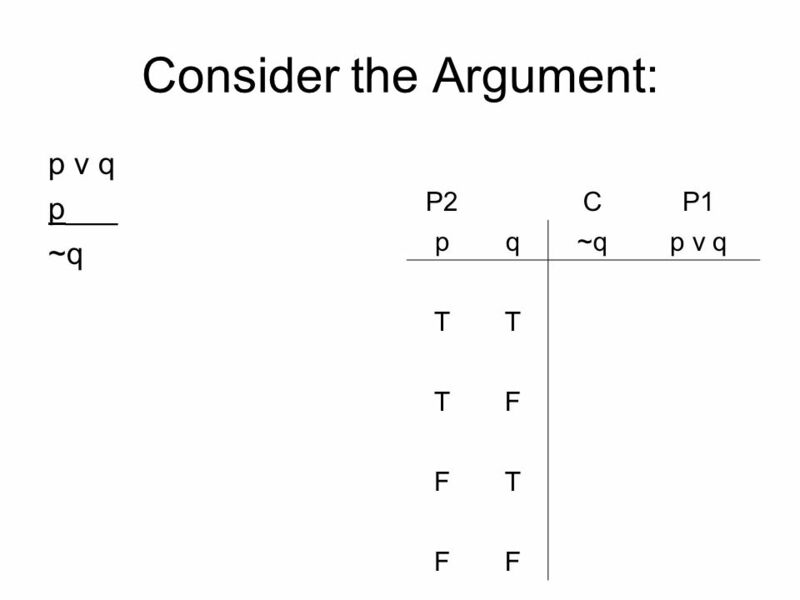 Download ppt "Reason and Argument Chapter 6 (1/4)." Logic The study of correct reasoning. 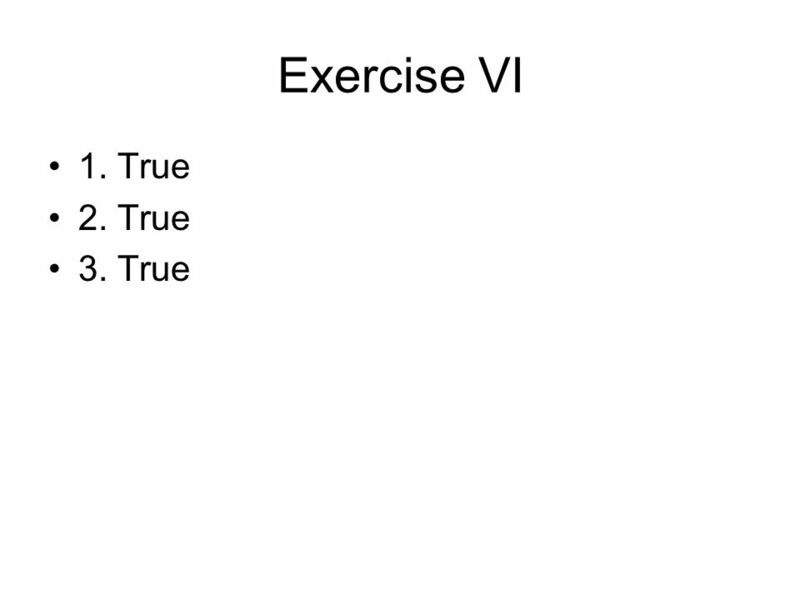 Truth-Tables. 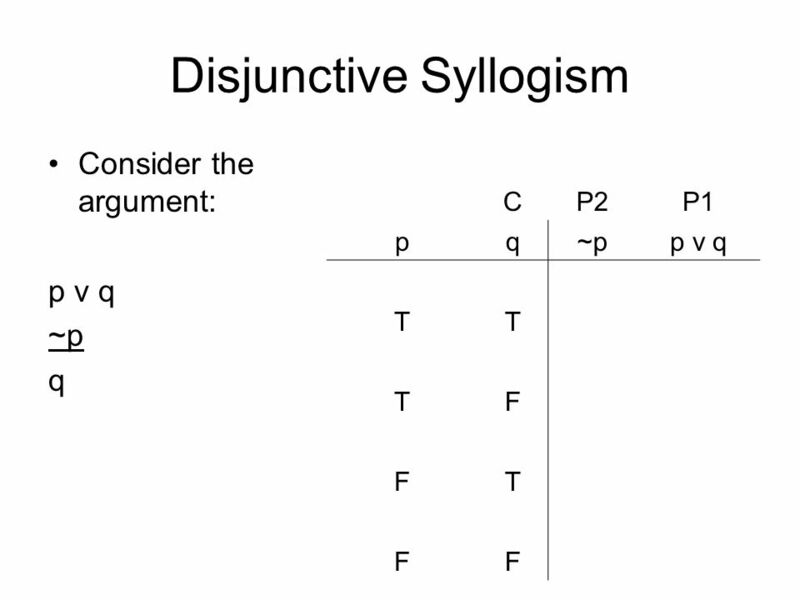 Recap Deductive Validity We say that an argument is deductively valid when it has the following property: If the premises of the argument. 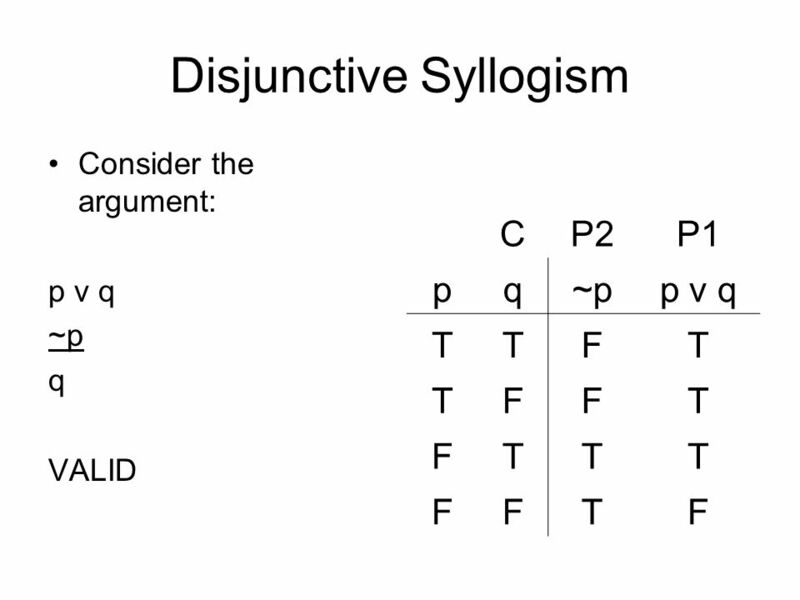 Sentential Logic 2. REVIEW Deductive Validity We say that an argument is deductively valid when it has the following property: If the premises of the. 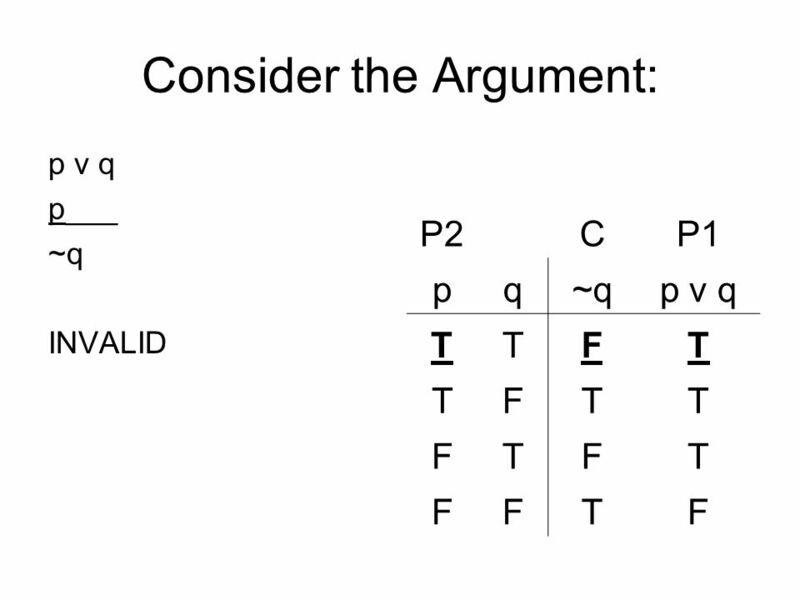 Sentential Logic. One of our main critical thinking questions was: Does the evidence support the conclusion? How do we evaluate whether specific evidence. John Rosson Thursday February 15, 2007 Survey of Mathematical Ideas Math 100 Chapter 3, Logic. 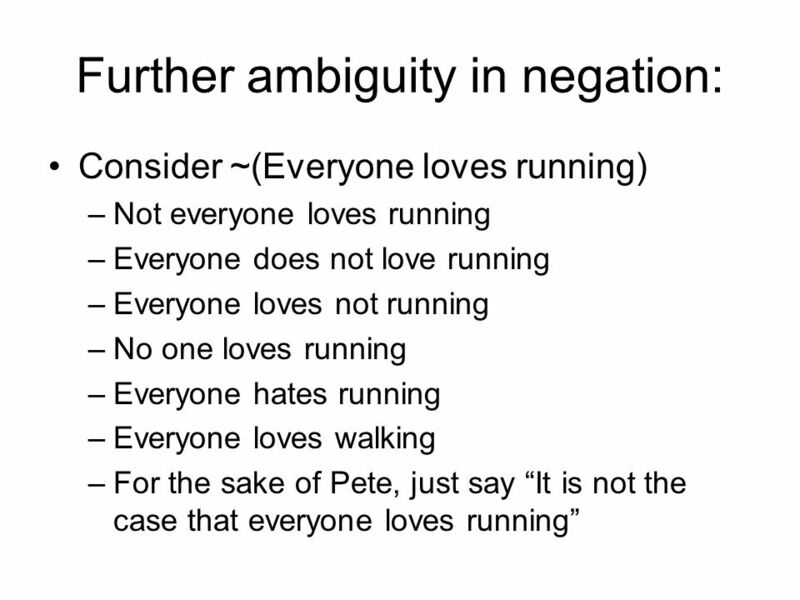 Review: Logic of Categories = Categorical Logic. Today’s Topics n Review Logical Implication & Truth Table Tests for Validity n Truth Value Analysis n Short Form Validity Tests n Consistency and validity. 1 Section 1.1 Logic. 2 Proposition Statement that is either true or false –can’t be both –in English, must contain a form of “to be” Examples: –Cate Sheller. 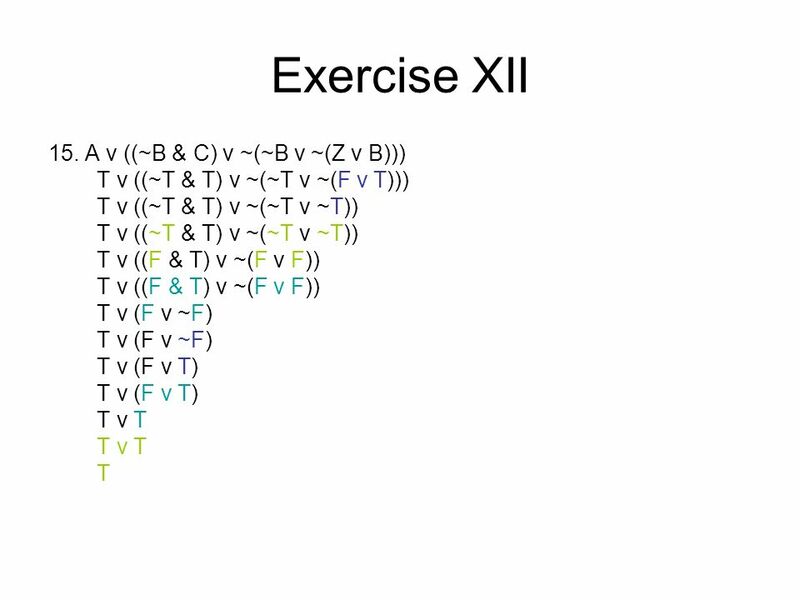 CS 285- Discrete Mathematics Lecture 2. 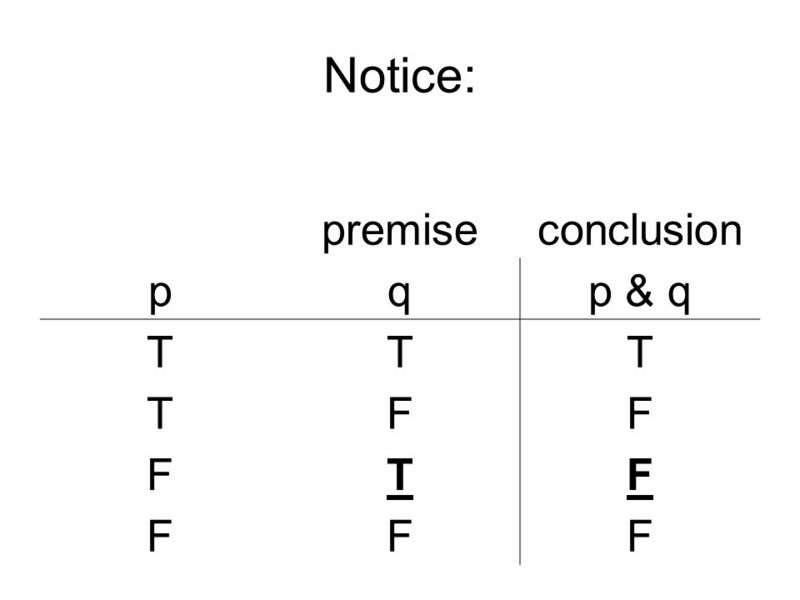 Section 1.1 Propositional Logic Propositions Conditional Statements Truth Tables of Compound Propositions Translating.